There are wonderful juxtapositions of layers of history, all around the ancient heart of Edinburgh. The famous castle, so emblematic of the city, sits on the core of an ancient long extinct volcano. Formed 340 million years ago, this rocky foundation sets the scene for wonderful tales which ripple out across the ages. Around 1000 years before Christ was born, the ancient inhabitants of this land built upon this towering rock, and people have looked out across the landscape from here ever since. The tales of King Arthur and his family are woven deeply into the landscape, and they still echo in our minds today. Known as the Castle of the Maidens, this was an ancient holy site, sacred to the cult of the nine maidens, and Arthur’s mother Igraine was initiated here at the heart of the land of her birth. Far below these sacred rocks lies the wonderful golden fountain of the maidens, in Princes Street gardens. Forged in France, the Ross fountain was erected here over 140 years ago, to much public outcry at the indecent nature of the voluptuous maidens. In many ways it is perfectly fitting, following in the long tradition of female veneration at the site, and yet the juxtaposition of golden French fantasy next to the robust and rugged rocks and stones of the castle and it’s rock make for an interesting contrast. In many ways Edinburgh is a city of wonderful contrasts, with its ancient volcanic bedrock still shaping the landscape today. Arthur’s Seat rises uncompromising and unapologetic in the centre of the city, giving us the gift of a wild and rugged mountain scape surrounded by the ever expanding flow of houses, churches and shops. The contrast between natures beauty and mans attempts, are served up side by side, leaving no doubt about the winner. It’s hard to ignore the layers of history when they are revealed so clearly before us. Old and new sit comfortably together, but the enduring qualities of natures creations are a humbling reminder about our place in the world. The collective endeavors of our ancestors are the layers which last, and that’s worth remembering in these self focused times. History rolls on, leaving stories and clues in her wake. This entry was posted in ancient sites, Edinburgh, history, nature photo, philosophy, photos, travel, weekly photo challenge and tagged Edinburgh, Edinburgh Castle, history, King Arthur, mindfulness, photography, postaday, sacred, travel. Bookmark the permalink. Edinburgh’s such a pretty city it’s hard not to like it! We don’t have any man-made structures older than 230 years here. We have plenty of natural grandeur millions of years old though. It always amazes me – the age and size of the castles overseas, and always built in impossible places. The craftsmanship and effort astounds me. And the history! If those walls could speak. Your writing adds texture to your photographs, imbues them with meaning. Oh I know, I love the history slipping through the cracks and stones. So many key moments of Scottish history happened within these walls, birth, death, plots and treachery!! Oh Seonaid, wonderful post as always. I MUST get to Scotland soon. Very high on my list – history, the moors and golf. How can you go wrong?! I would love to see Scotland through your lens and your words Tina. I’ve always been fascinated by, and read all I could, about the Arthurian legends, and your photos here are wonderful. But it is these words that struck me “the enduring qualities of natures creations are a humbling reminder about our place in the world”. So true! It’s hard to avoid this truth in Scotland, and in Edinburgh in particular, as the rocks and hills are so prominent! Thank you, I’m delighted you enjoyed the history. Apparently the original plan for the fountain was to place it on Princes Street at the junction with Castle Street, but that was deemed to public a space for such a vivacious display of golden flesh! It’s always a treat extraordinary to read your posts, Seonaid. Thank you for taking us on this tour – now I long even more to visit this summer! Oh, we have made up a route and booked hostels as usual. We followed your advice about the west coast, and will probably visit Skye once more – you have shown such wonderful photos and I don’t remember much from 1977, so, it will be a mix of our old trip and your advice! Of course I’m looking forward to it. What are your Edinburgh dates Ann Christine? Finish our round trip in Edinburgh, arrival 16 July late afternoon from direction Perth (stay the night there) and stay in Edinburgh only 17 July, Leave 18th early in the morning for home. Booked those 2 nights in Euro Hostel Edinburgh Halls. Hired a car for the trip, so we are leaving it on the airport. 17 july is our one whole day in Edinburgh. Driving down from Perth july 16 is of course an opportunity too . depending on where you are/live and what time you can find! I’ve marked the dates in my calendar, I usually work Wednesdays and Thursdays, so I will take one of them as a day off…. The Wednesday might work better, but I wonder what time you will get here from Perth? My email is seonaid@infernalmachines.co.uk if you want to private message…. Well, a day off…is that possible? I don’t want you to lose income because of me. Maybe in the evening, after your work? I don’t at all know when we come from Perth. I will keep your e-mail then, thank you! Beautifully written – like a story – which I suppose it is! I have always found the idea of ‘layers of history’ very seductive, whether in a city (had a flat in Edinburgh for a while), the landscape, or even an old building. I once lived in a late medieval house which was an interesting experience. Simple things like finding the site of a medieval doorway – which explained the hundreds of oyster shells directly outside, half buried in the ground. This is a lovely piece, and reminds me of how enriching it is to connect our lives with the past. Thanks for sharing. Rachael, that medieval house sounds wonderful, history literally beneath your feet! I love old houses, I’ve never lived anywhere less than 150 years old….but medieval would be utterly enchanting. Somehow I can never resist linking the present back through the past. 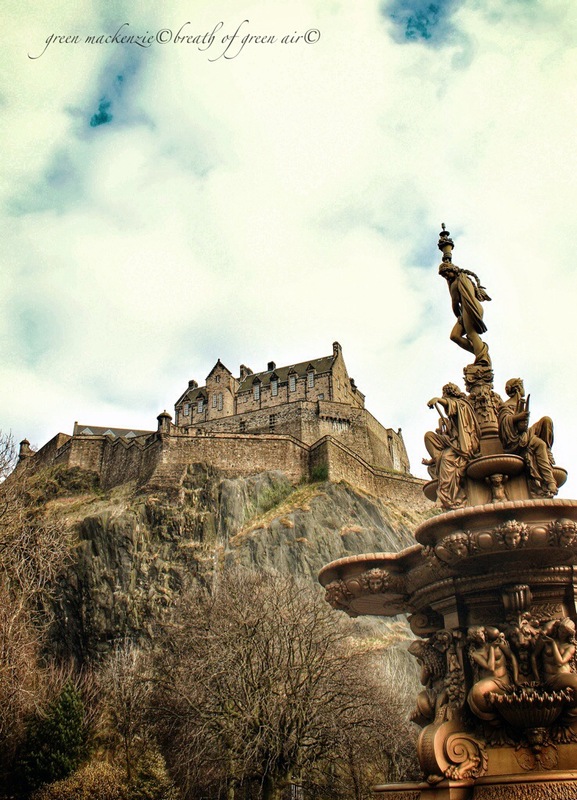 I love your ‘juxtaposition’ interpretation with the Castle and Fountain image Seonaid ! I can tell you are very proud of your City – and with good reason – as you’ve shown here . And you’re also right about my love of Edinburgh, I think it’s the vast and rich depth of history which enchants me so…..along with its beauty. 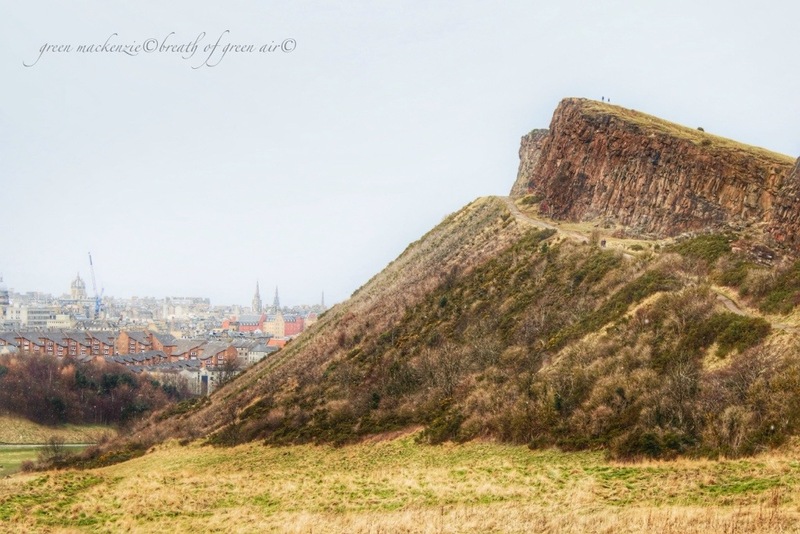 I really like the effects on Arthur’s Seat – I have not seen it from this angle before. It’s fascinating how our cities evolve. Wouldn’t it be great if we could go back through history with a time lapse camera and see the layers unpeeled? Oh Gilly, I would love to be able to do that. It happens in my mind, but I would love to see it. Imagine castle rock, surrounded by the Nor Loch and woodland, with wild deer running through the trees ……. I love layers of history, thanks for the tour! I’m mesmerized by this post. Years upon years of history in your first photo with aeons to follow. What a wonderful comment, I’m delighted you enjoyed the layers. It always blows my mind to roll back through the ages…. Always enjoy your shots in and around Edinburgh…nice post. Thanks so much, it’s wonderful that you enjoy my take on the city. Enjoyed the tour of Edinburgh! The history is very interesting and informative. I’m delighted you like them. The image at the top is stunning. I’m assuming that’s your work. Well done. It really is….and of course it’s status as birth place of the Harry Potter books makes perfect sense! As you wander around you can spot inspirations for her magical world. I recall taking a photo in Rome that had, in one shot that spanned no more than a couple of hundred meters in depth, Roman ruins, medieval walls, a Renaissance building, a baroque cupola, and modern buildings immediately behind it all. Time compression at its most readily observable. Amazing. I love compressed layers of history like this, they help me to keep life in perspective. I nearly posted a shot I took in Rome, but there are so many layers right here in my home town…..340 million years is hard to beat! I have always wanted to visit Edinburgh,and now, thanks to your enchanting tour, I have. Thank you for the historical tour.